Yeah yeah yeah – the Year Long Canvas is still sitting there staring at me. I am stalled out with her. I am becalmed like a sailboat at sea, but enjoying where I am. I am living in the NOW. I am currently painting other stuff that allows me to arrive at completion, because I am a task driven person and I like a feeling of accomplishment. I have not abandoned the YLC Project, but I seem to be on summer vaca from her. I’m spending time with people I enjoy, painting just for the fun of it, tending to my sunburn, going to concerts and hiking in the woods, in the rain, wearing my sparkling tiara that I was urged to make mine at a mountain garage sale on Sunday. Of course that’s silly. Would you deny me the pleasure of being silly? You better not….because I am hangin’ exclusively with people who make me happy these days – the ones who contribute positive vibes to my life – the ones who prop me up and make me laugh and leave me with a warm glow. You all know who you are. The Year Long Canvas needs my attention, I guess, but she is a great looking painting just the way she is. I don’t have it in me right now to alter her. I am SURE I have learned whatever lessons she was supposed to teach me already….pretty sure. So if you are one of the ones who keeps ragging on me about making some more changes to her, just for the sake of change, you need a really strong argument to convince me that I need to do something. Especially now. Maybe later in the summer when my back is against the wall and I know I am going to have to come up with some answers to questions from my esteemed instructor Homare Ikeda – maybe then I will panic and make some kind of change to her. But right now I am following the advice of that same esteemed instructor who commanded all of us students to HAVE FUN and ENJOY THE SUMMER and PLAY!. That’s what I want to do – that’s what I’m talkin’ about. I am going to do THAT. Relax – YLC is just fine. Alive and well and living here, with other canvases…..the ones who are finished. She is in good company. This entry was posted in art, living a good life, Uncategorized, www.epiphanysfriends.com, Year-Long Canvas Poject and tagged Homare Ikeda, Lifestyle, thankfulness, Year-Long Canvas Project. Bookmark the permalink. Yay for a sparkling tiara! 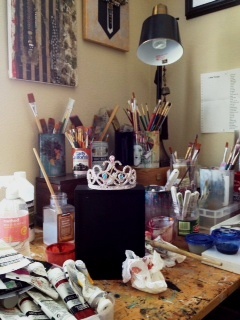 I double dog dare you to wear the tiara to art class on the day it resumes. OOOHHH…..I could do that…..maybe I will! 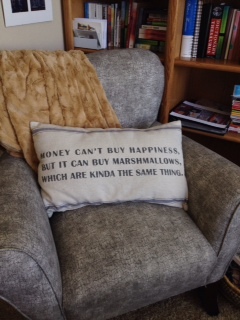 Like the look of your place, and like the pillow about happiness… and as for having fun, isn’t that what artists do when they’re working? 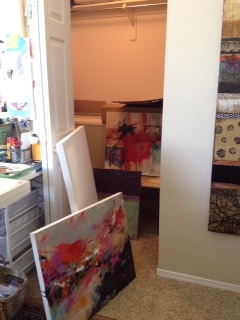 I have some paintings that took a year….one month to paint, and 11 months in time out! And then about 10 minutes to finish them. Just because you aren’t painting on it, doesn’t mean you aren’t “working” on it! I’m working on about 5 paintings and haven’t picked up a brush yet! But the process will show when I get them started…and a couple might not ever get started…but they got worked on to their completion before I ever spent anything but time on them….now is that efficient or what!